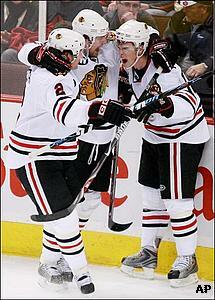 Jonathan Toews scored 2:07 into overtime to give the Chicago Blackhawks a 4-3 win over the Ottawa Senators. Just call them the Comeback Kids. The Chicago Blackhawks didn’t let a little thing like a two-goal deficit on the road against the Eastern Conference’s top team get them down. After spotting Ottawa a 3-1 lead early in the second period, the Blackhawks rallied to force overtime, then got a goal from rookie Jonathan Toews 2:07 into the extra session ( 700K ) for a gritty 4-3 victory over the Senators at Scotiabank Place on Saturday night. Once again, Patrick Sharp was a major contributor. He scored the game-tying goal 38 seconds into the third period ( 700K ) and set up Toews’ game-winner in the extra session. All this came after Sharp missed a penalty shot in the second period, when he fired wide on Senators goalie Ray Emery at 11:07 of the second period. He made up for it when his shot from the slot beat Emery early in the third. The Blackhawks are now 3-6-0 in December, but have won back-to-back games. Things weren’t looking good early for Chicago, as Ottawa opened the scoring when Dean McAmmond tallied his second shorthanded goal of the season 5:48 into the game ( 700K ). McAmmond stole the puck in his own zone, came down on a two-on-one with Daniel Alfredsson and got around Blackhawks defenseman Dustin Byfuglien before beating Nikolai Khabibulin with a backhander. Martin Lapointe tied it for Chicago less than two minutes later when he beat Emery with a slap shot ( 700K ), but Dany Heatley put Ottawa back in front when he redirected Wade Redden’s shot past Khabibulin at 10:43 ( 700K ). The goal was initially waved off, but replays concluded that Heatley’s stick was below the crossbar when it made contact with Redden’s blast. Heatley gave the Senators a 3-1 lead with his second goal of the night at 2:46 of the second period ( 700K ), but Brent Seabrook’s power-play goal, slap shot from the left point at 7:21, got Chicago back within one ( 700K ). “We didn’t sit back; we went after them when we needed to,” Blackhawks coach Denis Savard said. At 3-1, the Senators had multiple chances to build a bigger lead but Nikolai Khabibulin was there time and again to make a big save — especially on Heatley, who had several opportunities to complete a hat trick. In overtime, Sharp came down the left wing on a rush with Toews and made a perfect pass through the skates of an Ottawa defenseman. Toews crashed the net and redirected the puck past Emery for the game-winner. While some teams began their Christmas break following Saturday’s action, the Blackhawks aren’t done just yet. Chicago, now 17-15-2, will look to make it three in a row on Sunday night when they host the Edmonton Oilers at the United Center. If anything, Saturday’s victory showed the Blackhawks haven’t lost any confidence despite a shaky start to this month. With victories over some of the upper-echelon teams in the NHL, Toews believes a win such as this is one Chicago can build on.